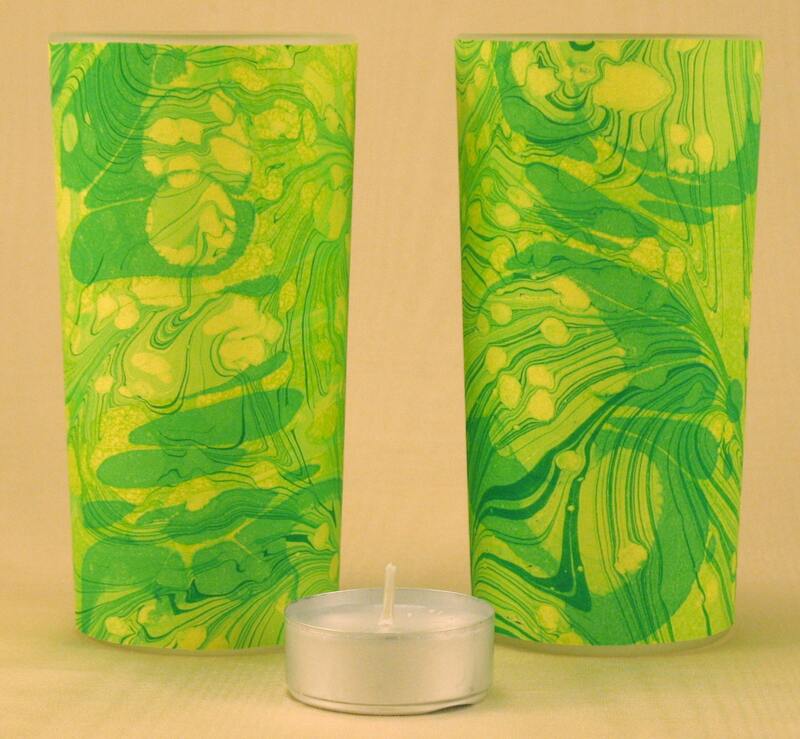 Tall Votive Candle holders in swirls of Green and Yellow. 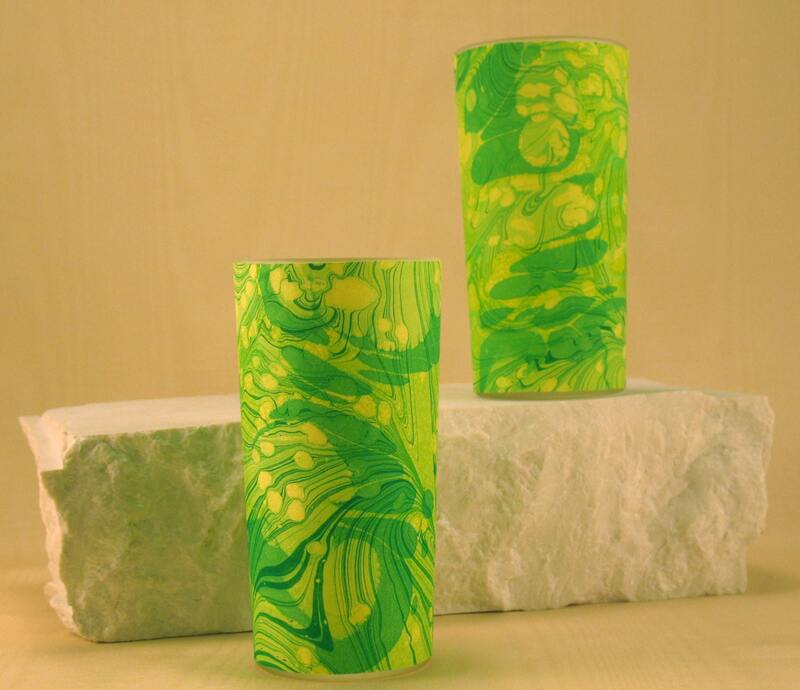 To create these distinct and decorative votive holders, I mount pieces of my hand marbled fabric onto 100% recycled paper and with that wrap a tall frosted glass votive holder. The frosted glass helps provide and soft glow behind the fabric that brings out the one-of-a-kind design of each. The votive measures approximately 5” (13 cm) high and has a top diameter of 2” (5 cm). It will hold a standard 10 hour votive candle or 4 hour tea light (pictured with the votive). 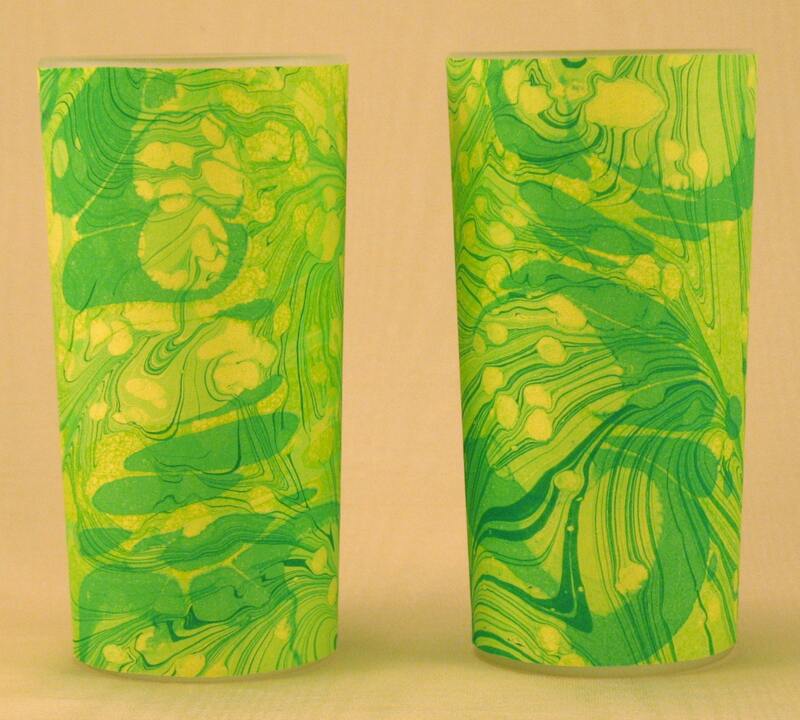 This set of two votives was created from one piece of silk so be sure to view all the pictures to see how similar and yet completely unique each one is. The price listed is for the set of two shown in the first three photos. Tea lights are recommended to facilitate easy cleaning. The silk mounted paper is not sealed (to retain the natural beauty of the fabric) and therefore the votive should never be submerged or placed under running water to clean. If votive candles are used and you need to remove excess wax, just place the votive holder in the freezer for a few hours and the wax will pop right out. In the last picture, votives are pictured in low light lit with tea lights. The votives on the left half of the picture are lit with a standard clear cup tea light. The votives on the right half of the picture are lit with a standard aluminum cup tea light.